Welcome to Issue 372 of IBOtoolbox News! There are so many marketing platforms on the Internet that you could simply give your money away to. IBOtoolbox is completely different! Not only is IBOtoolbox FREE, but also by being an active member of IBOtoolbox, building relationships and positively promoting your business, you will get results! I encourage all of you to get "all in" with your business and at IBOtoolbox! Don't sit on the sidelines watching; create your own success - participate and make things happen for you! Thank you for reading IBOtoolbox News, enjoy your newsletter! It's important to keep in mind that social networking sites are designed to enable others to communicate with others, network and build relationships. IBOtoolbox is not any different. It's all about keeping it real! Make sure to upload a picture of yourself - not a product or a logo and have your profile set up so that others can see what you do. You'll get much better results if you just be YOU! 1. Go to "My Advertising" under Site Navigation and click on "Create New". You will see a box appear where you can select the type of ad you wish to create. Select the size banner ad to create by clicking on the appropriate button. Below each button, it tells you how many impressions (views) each different ad costs. 2. The next step is to build your ad. The first thing you are going to do is give your ad a name. You will enter that in the box to the right of "Friendly Name". This name is for your reference only so name it whatever you want. 3. 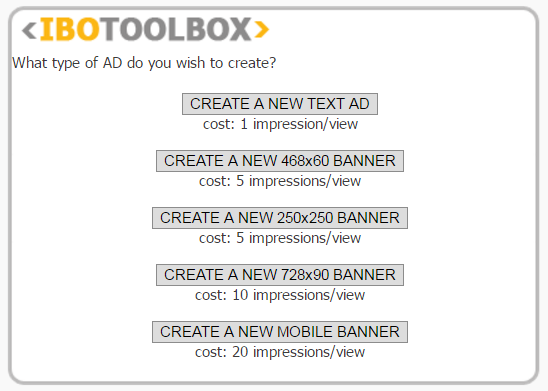 Since we are going to build a 468X60 banner ad, you will see "Ad Type: 468X60 Banner". 6. Now you are going to set the "Display Speed" which is how you want your banner ads delivered or shown. You can choose from "Default", "Fast", "Slow" or "Very Slow". 7. The next selection is "Display Ad On". You can choose from My IBOsocial Profile, Other Member IBOsocial Profiles, IBOsocial.com Main Page, IBOtoolbox Newsletter, IBOtoolbox Wall and IBOanswers Top. You can select to have your banner ran on 1 or all of these different locations. 8. When you are all done setting up your banner ad, click on "Save". 9. Finally to make sure that your banner is displaying correctly, scroll down to "My Advertising" and find your banner ad by Ad Name. Click on the "Preview" button to preview the banner to make sure it displays. 10. Your final step is to activate your ad. You will see "OFF" in red. You will need to click on the "Turn On" button to activate your banner ad. Once you do that, you will see "RUNNING" in green. At anytime you can go back and turn off the ad. By clicking on the "EDIT" button, you can edit the ad, reset counters or delete it if you want. Running ads at IBOtoolbox can get you more exposure for your business than any other paid or free platform can! IBOtoolbox's advertising system will bring in the most targeted audience that you will find anywhere on the Internet. Because IBOtoolbox receives over 300,000 visitors daily that are looking for business opportunities they can make money with and they are finding your products and services through search engines or through IBO's vast social media network. This a non-incentivized visitor/prospect base - the best there is! You will generally find a better click through rate on banner ads because people respond better to graphic images. Banner ads ran at IBO average a click through rate of 3-10% although many members have reported higher rates! Other factors that determine your click through rate are the banner size, where it is ran on IBOtoolbox! When returning to IBO, click on "My Wall Posts" (wall filter) to pull up your last posts. This way you can see if you have some new comments. Keep the conversation going by responding to comments that have been made on your wall posts, press releases and videos. This is a great way to interact and engage with other IBO members as well as build a great business relationship! "news-getallin" To redeem the credit code, log into IBOtoolbox, click on "Credit Center", then click "Redeem Coupon", follow the instructions within the IBO Credit Code Redeemer box to unlock the redemption tool, enter in the code, and click "redeem coupon". Credit code expires on the release of the next edition. Thank you for using IBOtoolbox! 468X60 Banner This banner is one of the most common size banners and can be ran on your IBOsocial profile, other members IBOsocial profiles, IBOsocial.com main page, IBOtoolbox Wall, IBOtoolbox News, and IBOanswers top. This size banner averages between 3-5% click through rate. 250X250 Banner This size banner can be ran on IBOtoolbox Right, IBOtoolbox News, and IBOanswers Right. The click through rate on this size banner averages between 5-7%. 728X90 Banner This banner is referred to as a "Leaderboard" banner and is probably the most popular size used and for good reason! This size averages an 8-10% click through rate! This size banner can be ran on IBOtoolbox Top, IBOlist Top, IBOanswers Bottom, Rebrandable Traffic and IBOtoolbox News. 320X100 Banner This is the common size for mobile devices. This size banner is ran on IBOmobile and is one of the most prized positions in the entire platform since it is only viewable to mobile users! In just a few days of this banner ad being available, it's already averaging a click through rate of 8-10%! As more and more members use IBOmobile, expect this CTR to go even higher! To figure out what your click through rate or CTR is, simply take the number of clicks divided by the number of views (impressions or times the banner is actually shown). Remember, the main objective of a banner is a "click" to get the visitor to a site that will give them enough reason to join a business, purchase a product or ask for more information.